Review posted December 12, 2015. Touchstone (Simon & Schuster), New York, 2015. 261 pages. Geeky girl makes good! I have to love this book – being so much of a geek myself. Felicia Day was even a math major! Of course she’s cool! (What? That’s not how everyone defines coolness?) Never mind that she was also a music major. And homeschooled before that. And a gamer. Oh wait! The flap says she’s the eighth most followed person on Goodreads. Now I’m jealous! Felicia Day is familiar to me because of seeing her star in the fabulous internet show, Dr. Horrible’s Sing-Along Blog. I was delighted to read the story of her life, because she’s as quirky as I am, and she has achieved her dreams. She’s open and honest and entertaining about her life. She hasn’t led a traditional life, and she talks frankly about a time when her video game playing did creep into addiction. Growing up homeschooled, people she met online were her first friends. Perhaps it’s fitting that her eventual success came via the internet. It’s hard being weird. No – it’s hard living in a culture that makes it hard. This book deals with hard – without rancor, without the ugly flush of one-upmanship. Felicia created a persona of the bewildered waif who somehow manages to manage (and occasionally triumph). That persona is a gloss on a similar, but more painful, reality. Her odd, compelling journey was more difficult than a lot of us who knew her knew. But that’s part of her gift: she makes crippling anxiety look easy. Another part of her gift is that she’s damn funny. Even if she’d come from the heart of normcore, her tale would be worth telling and well told. But she was raised in Crazytown, and the more foreign her territory, the more delightful – and somehow more relatable – her tale becomes. Reading this book is like spending an afternoon with Felicia, hearing breathless tales (they’re always breathless – Felicia doesn’t pause when she talks) of achievement, despair, and dazzling, almost transcendent nerdiness. This is the story of someone who found her place in a corner of the world that literally didn’t exist till just before she showed up. Felicia’s place is always off the edge of the map, where dragons wait, and this story is more than a memoir. It’s a quest. If you wanna survive, stay close to the redhead. That same motto “I am determined to create something or express myself, no matter how hard it is, even if my mom is the only one who sees it!” is the embodiment of how I view the web. For the first time, everyone has a chance to have his or her voice heard, or to create a community around something they’re passionate about and connect with other people who share that passion. Best of all, it rewards people and ideas that never would have made it through the system and allows the unique and weird to flourish. . . . I was raised incredibly weird, but one day I accidentally got brave and thought I had a unique point of view about gaming. I decided to jump into web video – a world I knew very little about – to express it. Who knew there was anyone out there who wanted to listen? I believe the next Oprah Winfrey or George Lucas will not come from a local news desk or college film program. He or she will come from the world of the web. Where the bar to entry is low, and where a group of kids can dream up a story and shoot it in their backyards. Regardless of whether someone gave them permission or not. I hope all my copious oversharing encourages someone to stop, drop, and do something that’s always scared them. Create something they’ve always dreamt of. Connect with people they never thought they’d know. Because there’s no better time in history to do it. There you have it! 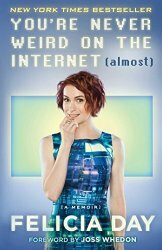 Felicia Day’s copious oversharing is delightful reading for anyone who’s even slightly geeky. She’s one of us, and she is achieving her dreams and learning about life along the way. What’s not to like?